The idea of having a divorce hearing and potentially needing to testify scares some people more than the prospect of starting over after years of marriage. If you are nervous about your upcoming divorce hearing, you aren’t alone. If you want to make it through your upcoming hearing with ease, it’s best to be prepared and follow all instructions given by your Florida divorce attorney. Here are some helpful tips when it comes to surviving your divorce hearing. Start by being prepared. Choose your wardrobe carefully, as you want to look presentable and professional. Wear something you feel comfortable and confident in since you are already going to feel anxious. Trying out new heels for the first time or squeezing into pants that are a size too small will make you want to bolt for the door before your case is even called. Don’t bring anything to the courthouse that will get you sent right back out. You can’t bring weapons, or anything that could be deemed a weapon, into a courthouse. It’s better to skip big bags and briefcases. Arrive with plenty of time to get through the security screening and to your courtroom. You want to be there with your attorney before your scheduled time so he or she can go over any last-minute changes. Don’t enter the courtroom with your cell phone on. Nothing will irritate a judge more than someone’s phone going off. Don’t be that person. It’s better to shut it off entirely rather than trust that vibrate or silent mode will work. When your case is called, your attorney will let you know whether you need to come forward or stay in the seating section. There are some types of hearings that don’t require you to testify, so your attorney may say it’s ok that you remain where everyone else is sitting. If you do have to testify, answer the questions asked and nothing more. Don’t offer additional information or start rambling out of nervousness. This gives the other side an opportunity to find something they can use against you in some cases. Keep your answers brief and topical. Don’t be tempted to falsify information or make something up because you think that is what the judge wants to hear. Lying under oath can net you a criminal charge in addition to losing out in your divorce. Some people are surprised to see their ex-spouse at some hearings and they are even more surprised when they have to sit next to them in some situations. Try to remain calm and do not engage your spouse or their attorney. Don’t make faces or let on that their presence affects you in any way. And, if your ex’s attorney tries to make you look bad, it’s natural to want to defend yourself, but do not get into an argument with his or her attorney. 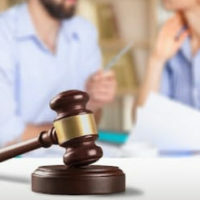 Getting through a divorce hearing can be a breeze if you have a good Florida family law attorney who thoroughly explains what to expect and what is expected of you during the hearing. If you have any questions about divorce in Florida or need an attorney, contact the Law Offices of Schwartz | White at 561-391-9943 to schedule a consultation.